It’s chilly and rainy here. The leaves have covered the sidewalks and I had to wear gloves and a hat to take the dog for her walk. It is fully fall here, there’s no denying that. There is even talk of some snow fall tonight. I had plans to go golfing today but with the arrival of rain it became a different kind of day. 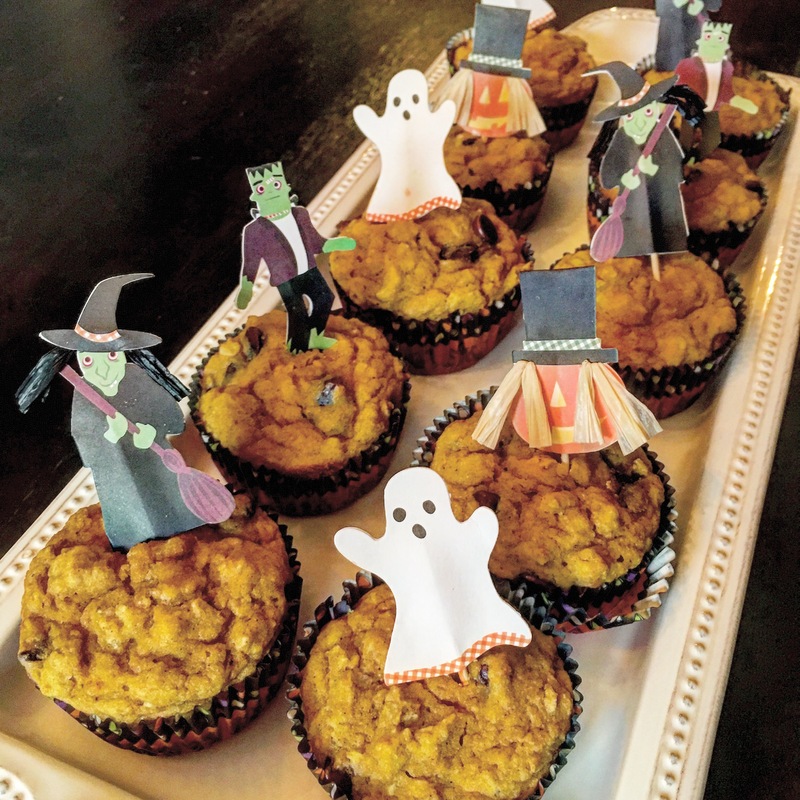 My daughter is turning 11 on Halloween, so I decided to cozy up and make her some muffins. She loves pumpkin muffins so I set out to make a healthy version that she could have for breakfast this week. I found a recipe that looked great on Food.com and knew that with a few tweaks of my own I could reduce the sugar and add some whole grains without compromising the taste or texture. The original recipe also called for nuts, but since my kiddo lives for chocolate and doesn’t love nuts in her baked goods, I subbed semi-sweet chocolate chips for the nuts. If you love both I think you could absolutely add nuts and chocolate (which would be my vote but since it’s her birthday and her muffins, I did what all mothers do from time to time and sacrificed. It was a big one but I’ll recover). What I love about pumpkin muffins, especially when you use whole wheat flour, is that you are getting good amounts of fiber and phytonutrients. Carotenoids from the pumpkin are what give it that beautiful orange color (just like in carrots). Epidemiological studies suggest that diets high in carotenoid-rich fruit and vegetables are associated with reduced risk of cardiovascular disease. Dietary carotenoids are also thought to provide health benefits in decreasing the risk of disease, particularly certain cancers and eye disease. Carotenoids are best absorbed with some fat, which is why I kept the oil in this recipe instead of replacing it with apple sauce which I sometimes opt to do when baking. The end result is a delicious, moist and flavorful pumpkin muffin that I am sure you’ll love as much as I do! Grease and flour muffin tins, or use paper liners. Bake for 18 to 20 minutes, or until muffins test done when a toothpick or knife inserted in the center comes out clean. Cool in pan or on a wire rack. Eat them all in one sitting Savor them over the course of a couple of weeks, keeping them in the freezer to pull out as desired.